"Traffic" is a totally character-driven drama and will not lose much in the transition to the small screen. But if you can rent the DVD, widescreen is highly recommended. "Traffic" is a socially and politically grandstanding soap opera about the narcotics trade and the futility of the "war on drugs." It's a film about how that war is propagated by bureaucratic demagogues in the United States government, not because they think they can stem the flow of illegal substances but because they think saying they want to is a way to win elections. "Traffic" is also gritty and realistic feat of cinematic logistics, following no less than 15 major characters (and more than 50 speaking parts) through several complex, well-acted storylines about all sides of the drug trade -- from kingpins to cops to policy wonks to addicts. So my hat is off to the picture's ever-brilliant director, Steven Soderbergh ("Erin Brockovich"), who certainly does a fine juggling act, involving the audience in every story on a personal level. Part of the film is about a Mexican narc (Benicio Del Toro) navigating a crooked justice system and struggling with the enticements of corruption. Another follows a new US drug czar (Michael Douglas) so out of touch with his teenage daughter he doesn't realize she is becoming an addict herself. 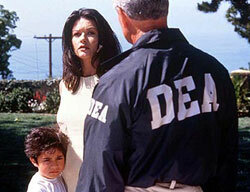 Yet another focuses on the naive wife (Catherine Zeta-Jones) of a recently busted San Diego drug trafficker, the DEA agents (Don Cheadle and Luis Guzman) who brought him down and the reluctant key witness (Miguel Ferrer) they are protecting. 1) The drug czar's pretty teenage daughter (Erika Christensen) and her affluent private school pals are presented as freebasing cokeheads without any kind of backstory or explanation of what drove this otherwise normal girl to such an extreme addiction. The girl is nothing more than a plot device and a fabricated juxtaposition of her square but stalwart father. 2) I don't buy for a second that kingpin's wife, played by Zeta-Jones, would be so utterly clueless as to be stunned by her husband's arrest. What did she think he did for a living? And just as I decided to let that slide, the character does this absurd 180, trying to grab the reigns of the crumbling drug empire, and becoming -- quite literally overnight -- a ruthless and savvy operator, ordering assassinations and driving hard bargains with suppliers. And all this while she's also persevering against the cops and being a good mother to her cherished young son. These unfortunately insurmountable fallacies arise largely because "Traffic" is a two-and-a-half hour film whittled down from a much longer miniseries that ran on British television in the 1980s. Soderbergh doesn't have the time to really explore his characters in this otherwise accomplished, perceptive and technically impeccable film. The director's seemingly effortless balance between guerilla-style filmmaking (shot with handheld digital cameras using available light) and Hollywood polish (the film doesn't look or feel like pretentious art house fare) gives "Traffic" an accessibility and a striking sense of realism. His innate ability to garner intimate, penetrating performances from his actors helps make all the interweaving subplots reasonably absorbing. And the film does make resounding points about our government's supply-side approach to battling the drug problem. During an airborne policy meeting with advisers from the DEA and other agencies, Douglas the drug czar blows up, demanding, "I want to know why there isn't anybody from treatment on this plane!" Amen to that. But "Traffic" walks a fine line between conscientious social commentary and pompous political drum beating, at times virtually elbowing the audience as if to say "what a profound statement we're making, huh?" It's precisely at such self-cognizant moments the film begins to feel more like a goulash of after school special, sorrows-of-addiction weepy, post-"Pulp Fiction" festival indie, Tom Clancy novel and estranged father-daughter day on "Jerry Springer."